Mirepoix is located in Midi-Pyrénées (see: France Regions Map), a region of southern France between Carcassonne and Pamiers. 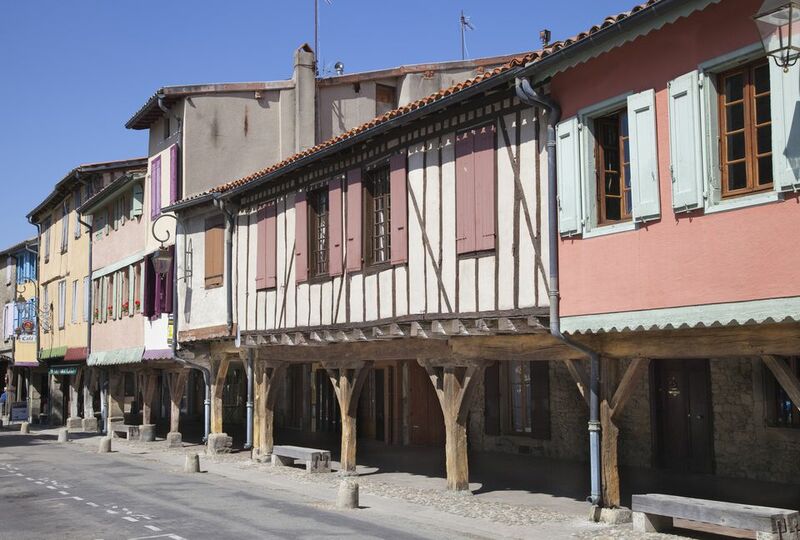 Approximately 3100 people live permanently in Mirepoix. Despite its small size, Mirepoix is one of the best examples of a medieval town in the region--and there are many good ones! The train station closest to Mirepoix is found at Palmiers. The closest international airport is Carcassone-Salvaza Airport. It is best to have a car to visit Mirepoix. Mirepoix is about 8 hours driving time or 8.5 hours via train from Paris. There is an SNCF Bus from the train station in Palmiers that takes you to Mirepoix four times a day. To stay central in the most evocative medieval square we've seen in Europe, Place du Maréchal-Leclerc, we recommend Hotel La Maison des Consuls - Mirepoix. For those who'd like to make use of Mirepoix's fabulous Monday morning market, mentioned below, we'd suggest renting a small villa or house. You can check Airbnb or HomeAway for the best options. Mirepoix was disastrously flooded in 1279. In 1289, Guy de Lévis rebuilt the town on the left banks of the river, with a large central square--Place du Maréchal-Leclerc--and streets laid out in a grid pattern. The Place du Maréchal-Leclerc is one of the best and most evocative medieval squares in Europe to see, and a perfect example of people-friendly architecture. The medieval buildings that line the square offer the shade of ground floor arcades held up by absolutely massive beams--those of the Maison des Consuls are carved with representations of people and animals at the ends of the beams. The tourist office of Mirepoix is in this square. Monday is the weekly outdoor market in the Place du Maréchal-Leclerc, and it shouldn't be missed. The church of St Maurice, built in 1298 by Jean de Lévis, was transformed over time into the Mirepoix Cathedral, Cathédrale Saint-Maurice de Mirepoix. It's Gothic and known for its wide nave, the second widest in Europe. The Mirepoix market is held on Monday mornings. It's many peoples favorite market in France. Not only will you find antiques, clothing, wine, and trinkets to spend your money on, you'll see local food specialties as well. Local musicians play at the surrounding cafes and restaurants. Dijon, it's more than mustard you know!